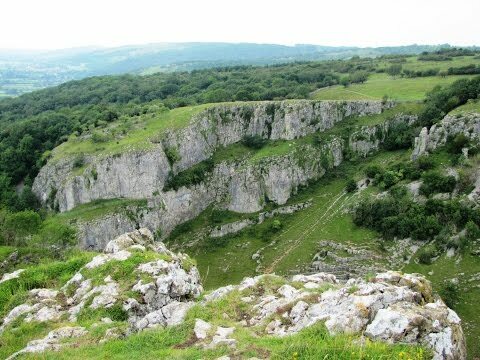 Cheddar Gorge is a dramatic, beautiful limestone gorge formed by meltwater floods during the cold periglacial periods which have occurred over the last 1.2 million years. The cliffs stand at 450 feet and are a Site of Special Scientific Interest. The gorge, including the caves and other attractions, has become a major tourist destination and was named as the second greatest natural wonder in Britain. The north side of the gorge is owned by The National Trust and the south side by the Marquess of Bath’s Longleat Estate. There are many caves in the gorge but only the two main caves both named after their discoverer, Gough’s Cave discovered in 1903 and Cox’s Cave discovered in 1837, are open to the public. Another cave named the Crystal Quest is a children’s entertainment walk. The gorge also houses goats of all colours and Longleat Estate introduced them in the 1970’s to replace the sheep but in 2007 The National Trust released a flock of feral Soay sheep to graze on its side of the gorge to encourage different species of wildlife and flora and fauna. Many wild birds including peregrine falcons, buzzards, kestrels, ravens and grasshopper warblers can quite often be seen flying and nesting in the gorge. Cheddar is a large village situated on the southern edge of the Mendip Hills in the county of Somerset. The village gave its name to Cheddar cheese the most popular cheese in the United Kingdom. There is only one remaining working factory left in Cheddar which is open to the public and has a visitors centre. There is a guided tour of the factory, to learn and watch how cheese is made. Cheddar cheese is now made and consumed worldwide. Cheddar was also a strawberry growing area. Since the 1880’s Cheddar has grown strawberries, on the south facing lower slopes of the Mendip Hills. The strawberries were transported to market on the Cheddar Valley Line which ran from Yatton Railway Station through Cheddar to Wells. The line opened 1869 and was closed to passengers in 1963 and a year later closed to the transporting of goods. The line is now a railway walk and cycle track known as the Strawberry Line Trail. Cheddar village also offers other tourist attractions such as the caves, a museum of prehistory, a model museum, the Gorge Tour Bus, Jacob’s Ladder which consists of 274 steps up to the lookout tower and then there is the cliff top gorge walk and rock climbing for the more adventurous. If you are not so fit or do not wish to walk you can purchase a ticket to go on the open topped Gorge Tour Bus which takes you round all the attractions. The bus is a full day out so if you do not get to go to all of the attractions or you run out of time you can return another day to use any part of your ticket you have not used which is valid for 10 years. The bus runs daily from April to September and at weekends only in March and October. We park in the car park just at the junction of the Cheddar Gorge valley road. We walk through the village passing the pond and then the Cheddar Gorge Cheese Company on our left. We keep heading forward, with the stream on our left, looking at the shops and eating places. When we see the Cheddar Toy and Model Museum on the left we turn left up the stony track to the side of the museum. We walk for a short way then turn right up some stone steps and follow the permissive path, sign posted Gorge Walk National Trust, going to the right uphill into the woods. We keep heading forward steeply uphill through the trees until we come to a gate. We go through the gate into the open field and bear to the right on a well walked grass path towards the wall and gorge. At the wall we follow the path now going to the left and still going uphill until we come to a stile. We go over the stile and follow the steps heading downhill until we come to a hedge we turn right and keep heading downhill until we reach the road. At the road there is a path opposite which you can use, but we turn left and walk on the road for approx 100 yards. After the bend in the road and where there is a parking area we turn right up a footpath into the trees. We head uphill through the trees as we get near the top we go through a gate into an open field and follow the footpath going to the right along the top of the gorge. We now just keep following the well worn path along the edge of the gorge admiring the views as we go. Cheddar Reservoir which is about the size of Cheddar dominates the view. We eventually arrive at the lookout tower which we go up to admire more of the scenery around us. We then head down Jacob’s Ladder, just near the tower, which takes us back into the village. We turn left to go back to the car park. A hard walk with some very steep inclines and declines. Approx 3.25 miles using OS map 141 Cheddar Gorge. Cheddar Gorge village in the county of Somerset. From Bristol take the A38 southwards then take the A371. After approx 2 miles you arrive in Cheddar and Cheddar Gorge is a turning off to the left. There are two car parks in the village and more parking areas on the road going through the gorge. There are public toilets in the car park and in the village of Cheddar Gorge. For refreshments there are plenty of shops, cafes, tearooms and pubs in the village itself and also in Cheddar town. Followed your route through Cheddar today using the permissive path. You’re right when you say it is steep! We walked with our daughter and her boyfriend and we are all relatively inexperienced walkers and found the walk hard but enjoyable. We picked a great day weather wise as it is one of those fresh cold but sunny days which are ideal for walking. My wife (editor of the walks) and I would like to thank you for kind comments on the Cheddar Gorge walk. All the walks are done on our days off and this gives us great encouragement to carry on. This week on thursday 12th April we will be uploading Kinder Scout in the Peak District. We stayed at the old Nags Head in Castleton rates from Monday to Thursday £25 per person we think this walk would be one you would really enjoy. hi i am going up to Glastonbury camping this weekend and wandered if you encountered any cattle on your cheddar gorge walk as we are taking our dog with us and we are looking for some dog friendly walks to do. should be fine. Have a great weekend.